"Bye, bye, Bilbo!" There is no bigger J.R.R. 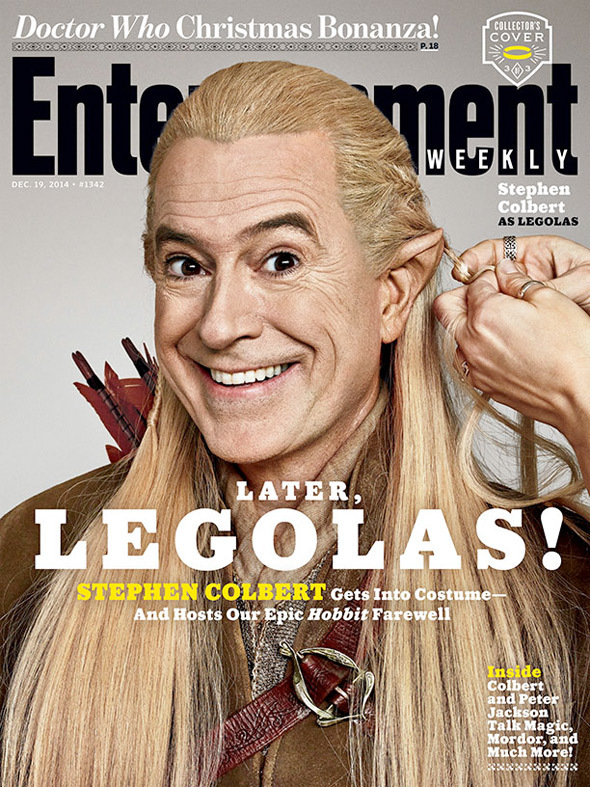 Tolkien fan than Stephen Colbert. He hosted the Hall H panel for The Hobbit at Comic-Con this summer, and appears in small cameo roles in the recent three movies (not to mention he can out-trivia anyone). With the grand finale, Peter Jackson's The Hobbit: The Battle of the Five Armies, arriving in theaters in just another week we're getting the last marketing push and this one takes the cake. 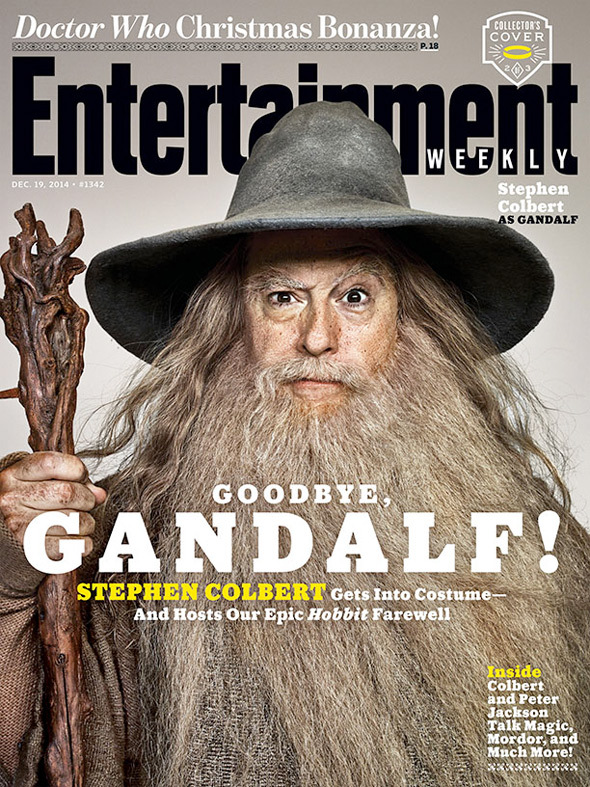 Entertainment Weekly has made three different covers for their latest issue featuring Stephen Colbert in full make-up/costume as three characters: Bilbo, Legolas and Gandalf. These are perfect, Colbert gets my respect for doing this. I'm excited for this last movie, one final adventure in Middle Earth. 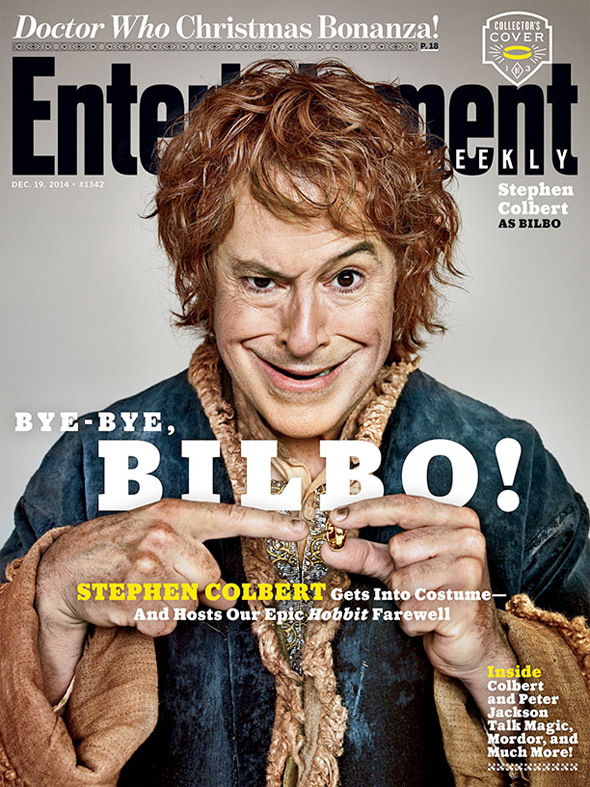 Here's all three of the fun Stephen Colbert as The Hobbit characters covers from EW.com. Your favorite? The Hobbit: BOFA hits theaters next week, and is worth seeing if you love Middle Earth as much as we do. In a hole in the ground there lived a hobbit… J.R.R. Tolkien's The Hobbit, being directed by Peter Jackson as three separate movies, is set in Middle-Earth 60 years before Tolkien's Lord of the Rings, which Jackson and his filmmaking team brought to the big screen in a trilogy ten years ago. The films, with screenplays by Fran Walsh, Philippa Boyens, Guillermo del Toro and Peter Jackson, were shot consecutively in 48FPS 3D using the latest cameras. The Hobbit follows the journey of Bilbo Baggins, played by Martin Freeman, who is swept into an epic quest to reclaim the lost Dwarf Kingdom of Erebor. The Battle of the Five Armies arrives in theaters in HFR, IMAX & 3D on December 17th later this year. It all ends next week - enjoy the finale. Finger goes in and out of the hole.